Welcome to iNK THINK TANK! The award-winning authors of iNK (Interesting Nonfiction for Kids) promote the use of nonfiction in classrooms through programs that help teachers use real books to teach to curriculum standards in ways that excite and inspire students. We are now a nonprofit! With a strong emphasis on nonfiction, the Common Core State Standards and many individual state standards make this the perfect time to get to know iNK. The first book in our Nonfiction Minute print collection, published in October 2017. 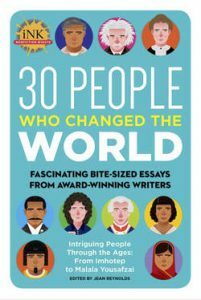 In this collection of 30 essays, each historical figure has a short piece dedicated just to them, with helpful and intriguing visuals. Learn more! In an introduction on the “For Teachers” page, Dr. Myra Zarnowski of Queens College gives suggestions of how to use these nuggets of nonfiction in the classroom. You get to know our authors so maybe you’ll get their books from the library. And it only takes a minute! A free resource to find books on all subjects for all ages that fit into your curriculum. iNK will immerse your school in the excitement of learning when teachers and students collaborate with iNK authors. These cost effective “writer in residence” programs are delivered through interactive videoconferencing and written support through communication on a private wiki. Almost every day from January, 2008, through June, 2014, iNK authors shared their thoughts on all things nonfiction. The blog is a treasure trove of information, opinion, musings, humor and general thoughtfulness. Vicki Cobb, a former Contributor to the Huffington Post, now posts her own Vicki Cobb’s Blog where she writes on education and reviews children’s nonfiction books. © 2019 by iNK Think Tank, Inc.